As Catholics, we seem to live under so many laws and restrictions. We cannot eat meat on Fridays. We must fast one hour before meals. If we have committed a serious sin we cannot come for communion. We must go to church every Sunday. We must do this. We mustn’t do that, and the list goes on and on. Is Christian living all about keeping laws? Yes and No. Christian living demands that we keep one Law – the most fundamental Law of all, which is Love. The Law of Love must be the basis of all other laws. If one strictly keeps all the other laws but fails in the law of love, then one has failed in everything. The law of Love defines all other laws and gives them their proper meaning. 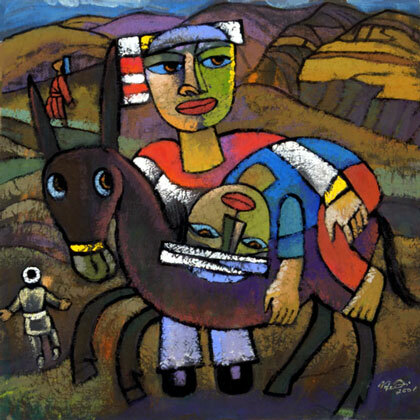 In the gospel, we have the famous story of the good Samaritan. The earlier two persons who walked passed the person in distress were not really ‘bad’ people. In fact, they were considered ‘holy’ persons, who took great trouble to keep the law. They were most likely heading back home after visiting Jerusalem where they had performed their religious duties. To touch someone who was covered in blood would be to touch someone considered ‘unclean.’ The Jews were very concerned about religious purity. By keeping their bodies clean, they wished also to keep to their spiritual lives clean. It may seem strange to us, but the priest and Levite were actually trying to being good Jews. Jesus then gives us the example of the Samaritan. He is an outsider, a non-Jew. Among Jews he is considered ‘unclean’ and Jews would compare Samaritans with ‘dogs’ and ‘demons.’ Yet, it is this Samaritan who reaches out to help the man in need. He not only helps in a minimal way but goes out of his way to make sure that the man’s well-being is taken care off till his recovery. This generosity exemplifies the love which Jesus speaks about. The priest and the Levite kept the Jewish law but forgot the law of love whereas the Samaritan, who failed to keep the Jewish law, fulfilled the greater obligation – he lived the law of love. Love is not like any other kind of law. The Law of Love is never imposed from the outside – it is written in our hearts, as the first reading tells us. If we honestly examine love, we can never see it as a piece of ‘law’ which compels us to do things against our will. That is the beauty of love. It is always freely given and freely received. When a parent stays up all night to take care of his sick child, is it reluctantly done out of obligation? No, it is done out of love. When a man gives up his own personal hobbies so that he can spend more time with his wife and children, is it done out of obligation? No, it is done out of love. Love never forces itself onto the will of anyone. It must be freely given in order to be true love. Jesus became the perfect example of this love. By becoming man and dying on the cross for us, Jesus gave us the most perfect expression of love. He could always choose to remain as God. He could always choose not to die. But he didn’t. Instead, he freely chose to become one of us and to die for us so that we may live. In his life and in his death, he was faithful to the greatest law, the greatest commandment of all – Love. Let us pray for ourselves during this Mass that we would follow the example of the Good Samaritan, that we will follow the example of Jesus, so that we will not blindly follow the laws of men and the laws of the Church while forgetting to follow the greatest law of all – the law of Love.